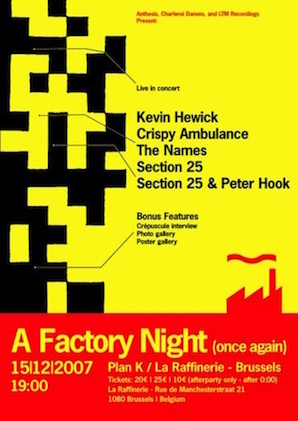 Live DVD souvenir of A Factory Night (Once Again), the memorable live event staged at Plan K in Brussels on 15 December 2007 featuring live performances by Section 25, Crispy Ambulance, The Names, Kevin Hewick and Peter Hook. Shot in High Definition with five cameras and a digital stereo soundtrack, the live section of the DVD features more than 2 hours of in-concert highlights (29 tracks) from all four bands, as well as the encore of the New Order classic Temptation by Section 25 and Peter Hook. Bonus features on the NTSC format Region 0 DVD include poster and photo galleries, as well as a rare 1981 television interview with Annik Honore exploring the early history of Plan K, Factory Benelux and Les Disques du Crepuscule. The full set by The Names is available on the separate dvd "Nightshift: Live at Plan K".